I'm back from training with some daily characters! 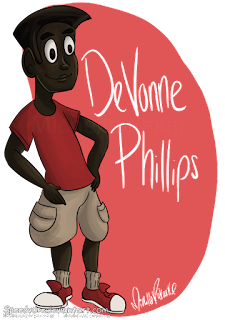 DeVonne is a very curious orphaned boy who is very intrigued by riches. He lives at Malcolm's Daycare and becomes very interested in Shaw, since he is a World Leader. DeVonne is able to befriend Thing in order to get the information that he wants. His initial greed leads to an everlasting friendship with his newfound brother. Volcanorus is the leader of a band of skating demons who rebels against the leaders of Demonica. He thinks he has great authority, and even offers that they become his loyal servants once he rules. Volcanorus has a lot of confidence and is extremely fast. 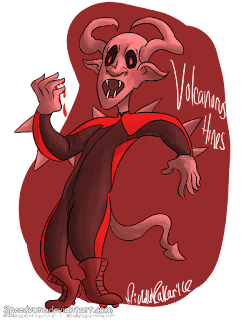 He is able to skate at inhuman speed, which is why he is deemed the leader. Though, his confidence gets the best of him, and he meets a very unfortunate end at the hands of Sanders.